There is an ongoing to attempt to rig Lagos State Governor, Akinwunmi Ambode, out of the All Progressives Congress’ primary scheduled for today as loyalists of Asiwaju Bola Tinubu have begun voting in a fake primary which is going on at the moment. 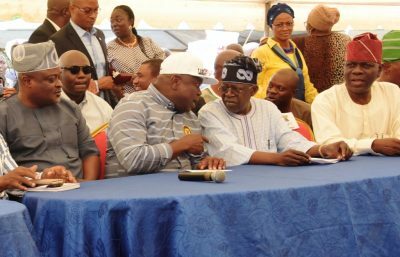 Tinubu and his camp have been hell-bent on edging Ambode out of the race by hook or by crook as this latest event indicates apart from previous efforts to intimidate the governor with impeachment and other threats to stand down as an aspirant in the 2019 governorship poll. This is despite the fact that the party’s National Working Committee-appointed panel led by a former Governor of Cross River State, Clement Ebri, said voting had not commenced as the party was still trying the party was still working out the modality for the election. Speaking with journalists, Ebri stated as of the time of filing this report that voting had not commenced as materials had yet to be made available to all the polling points. According to him, voting in the primary could not have started at the moment because efforts were being put in place to ensure a hitch-free exercise. “I can confidently tell you that we have not commenced voting for the governorship primary in Lagos. We’ve yet to work out the complete modalities for the elections to begin. There are not materials yet distributed for the start of the voting. “If any election is holding at the moment, it cannot be one sanctioned by the APC’s NWC. It is a mock election. Please ignore it,” Ebri told journalists. During a visit to Lagos State governor yesterday, Ebri had promised Lagosians: “We have people of integrity in this panel and I can assure you that we have the experience to conduct this exercise. We assure you of our sincerity and transparency and credibility. Responding, Ambode had expressed confidence in the NWC and Ebri’s team. “This is a star-studded team; the members are distinguished Nigerians in their individual and collective rights. There can’t be any better team than these distinguished personalities. “I must tell you that what you have taken up may look like a political assignment, but history is on your side. You are being called upon to discharge a selfless service that would determine the future of this country and the greatness of this state,” the governor had said.